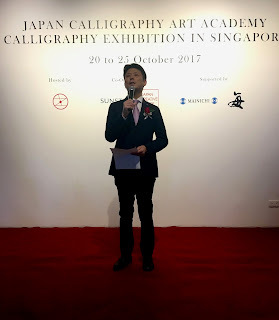 Last Friday, I attended the grand opening of the Japan Calligraphy Art Academy Calligraphy Exhibition at The Luxe Art Museum Singapore. 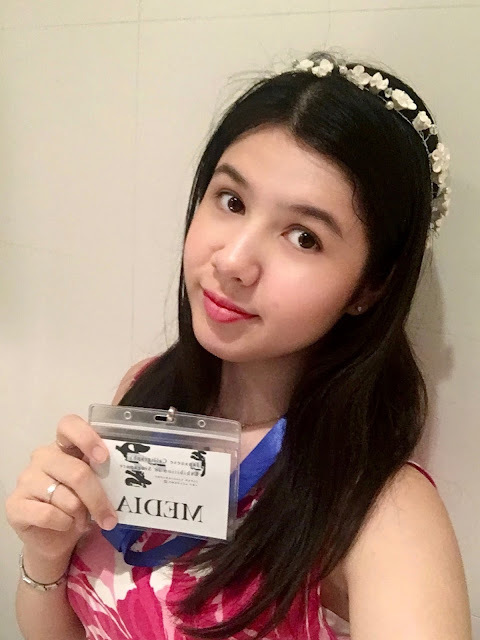 I was part of the media team, and got front row seats at the event. (Woohoo!) 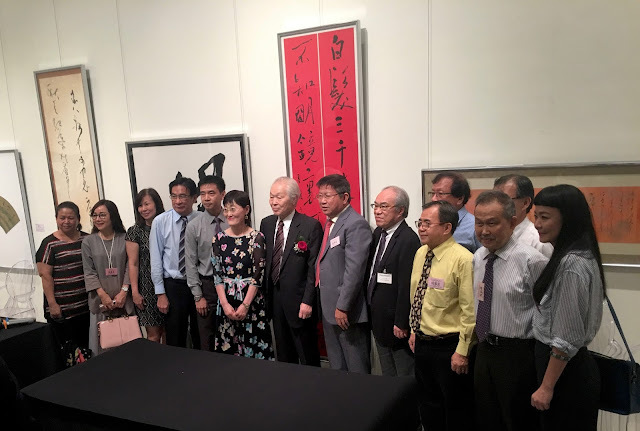 The event had light food, and there was a great turn-out of a blend of Japanese and Singaporean attendants. In a sea of black suits, I stood out with my pink dress. 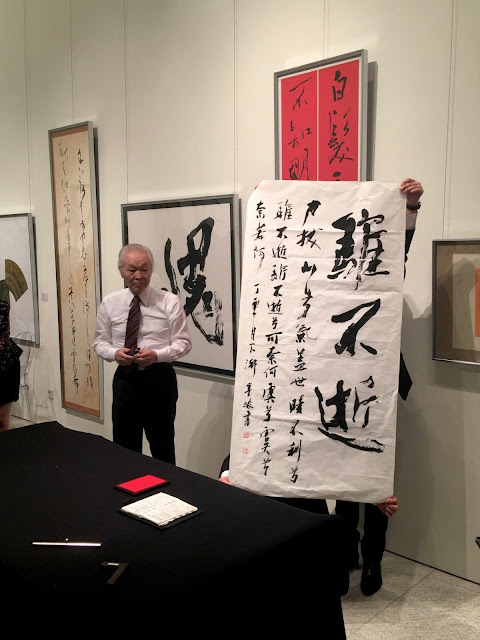 Bokushun Kito, the first speaker, is Board Chairman Representative Director of the Japan Calligraphy Art Academy. During his speech, I found out that it will be the Japan Calligraphy Art Academy’s 72nd anniversary early next year. 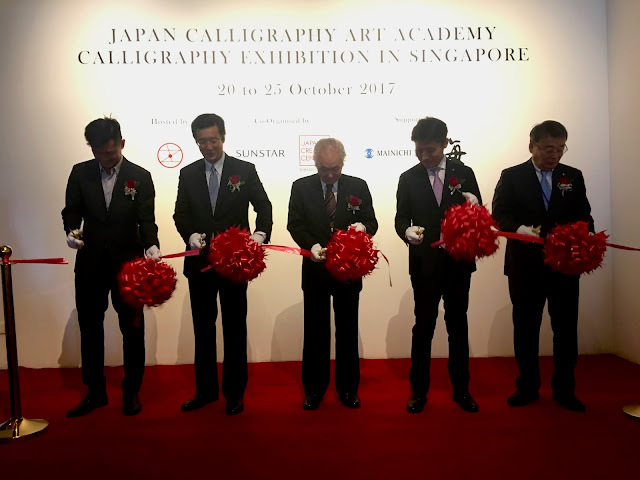 Mr. Kito said that he wanted visitors of the exhibition to feel and experience Japanese culture through the art works displayed. The second speaker, Kenji Shinoda, is H.E Ambassador of the Japan Embassy in Singapore. 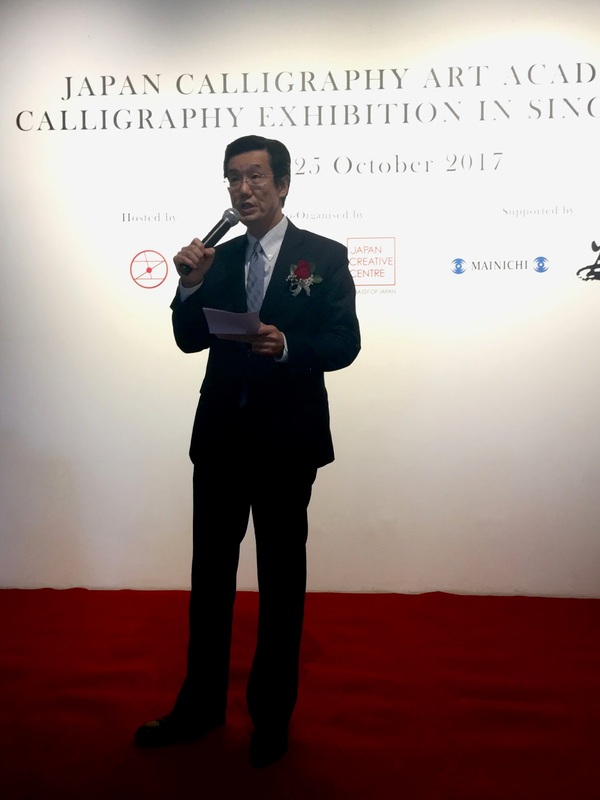 His hope is that the exhibition would inspire Singaporeans to understand the elegant and beautiful Japanese art form that is Japanese calligraphy. Following him, a representative of the Sunstar Group, Yoshihiro Kaneda came on stage to give his speech. 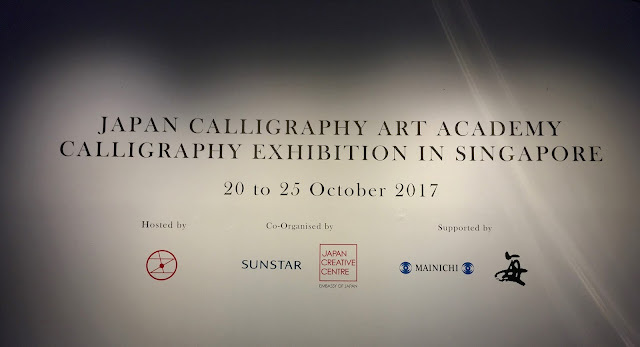 He talked about how Sunstar wanted to act as a bridge between Japan and Singapore, and said that it was fitting that the exhibition was held in Singapore, where diverse nationalities and cultures mix. 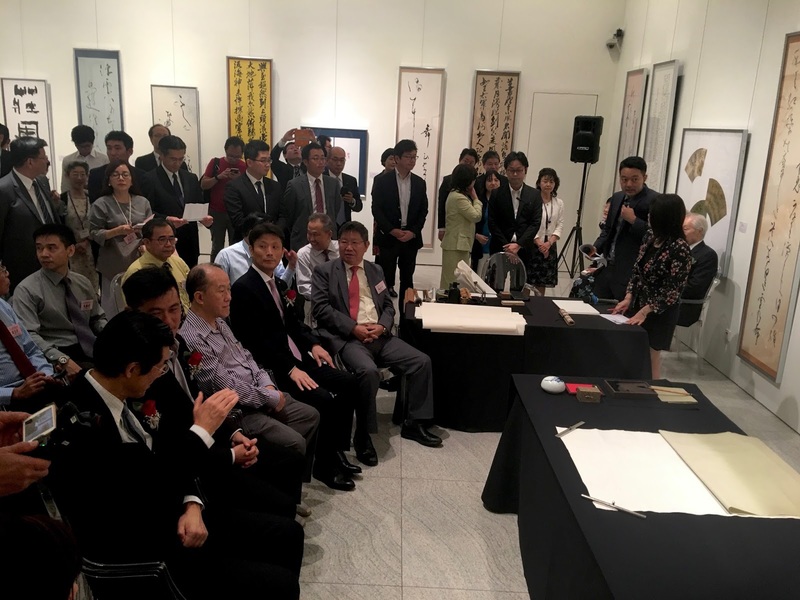 Finally, chief executive director of the People's Association, Desmond Tan was the guest-of-honour for the event. He was rocking it without a speech prompter or any notes. He was eloquent and talked about the importance of strengthening ties between Japan and Singapore. After that, we were ushered into the exhibition hall where all of the art works were being displayed. It was time for the calligraphy demonstration. The first of three artists to perform that day was Matsui Gyokusou. After completing her painting, the emcee asked if she had anything to say to the audience about how she was feeling or anything she had to say about the painting. Matsui said that she wasn't nervous today. 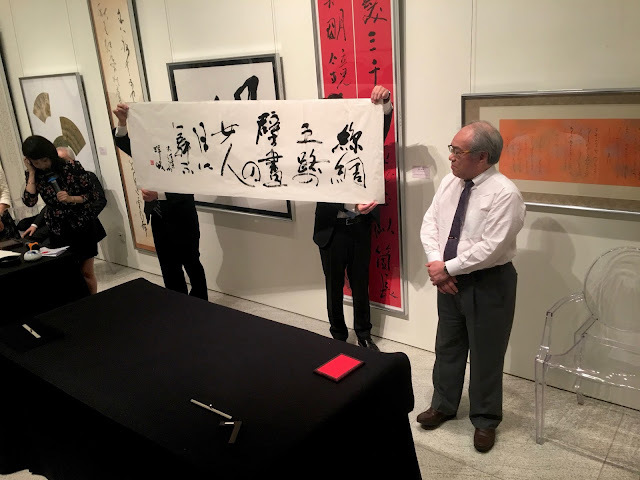 She also told us that we should take note that Japanese calligraphy doesn’t have to be drawn on a white paper. The paper used in her painting has gold flecks and a gradient. So when viewing the paintings within the exhibition, we should not only take note of the calligraphy but the paper, too. I liked the light, airiness of her calligraphy. The next artist that performed was Ohtani Yoshun. His painting depicted a maiden on the Silk Road. 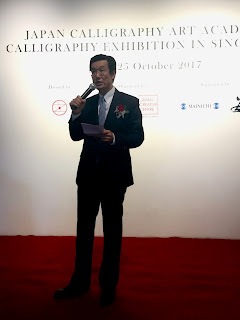 Ohtani noted that unlike Matsui, he was feeling nervous today as there were many great Chinese calligraphers present at the event today. 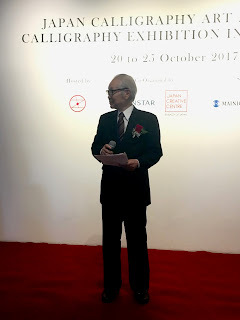 He mentioned that at the Japan Cultural Workshop Day that was set to happen the next day (21st Oct), there was a movie that was going to be shown called “Shodo Girls”. The movie tells the story of how a group of girls revive their sad town by organising a calligraphy performance competition. Then he joked that the movie had their "Shodo Girls" and he was, instead, a “Shodo Uncle”. The joke received a peal of laughter. 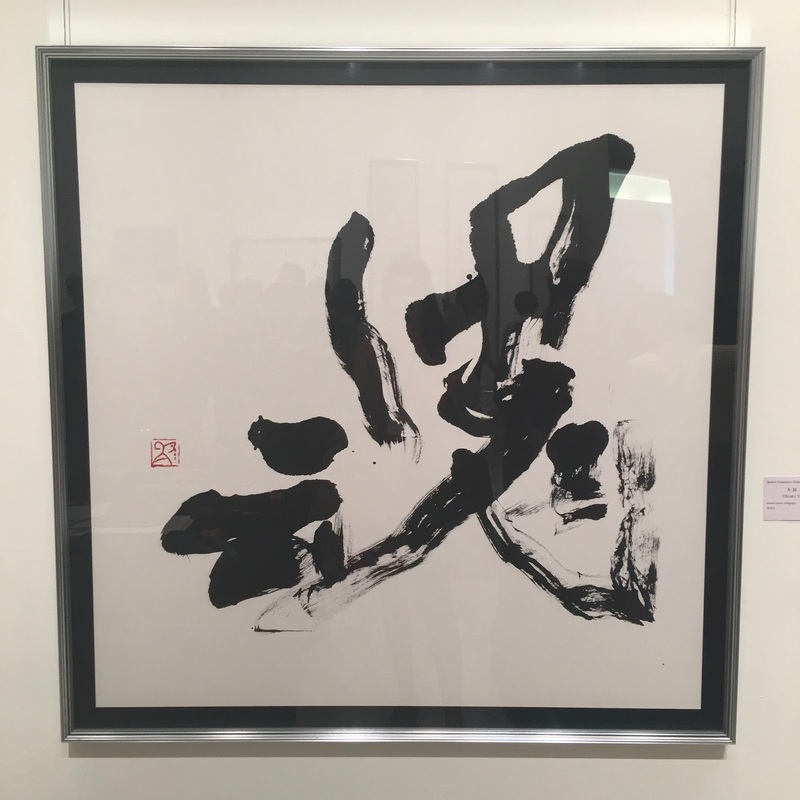 In Mandarin, we'd say that his calligraphy has qi. A sort of strong energy that gives the art work life. The last artist to perform for the day was Kito Bokushun. 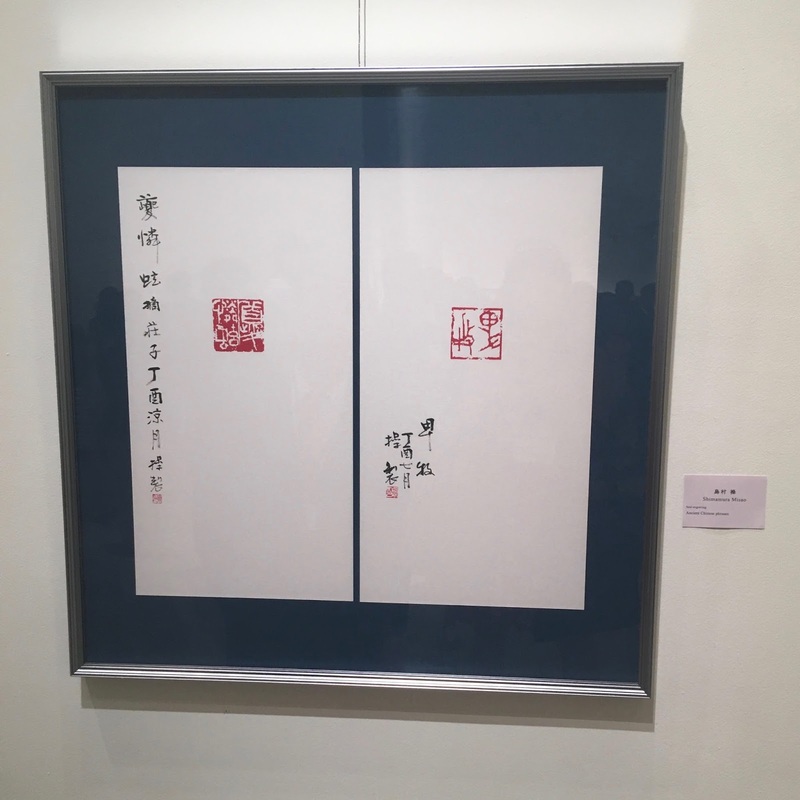 He wrote a series of calligraphic words from a famous Chinese poem. The poem was written by a general going to war, and is one of Kito's favourite poem. I really liked how the large and small words balance the art work. 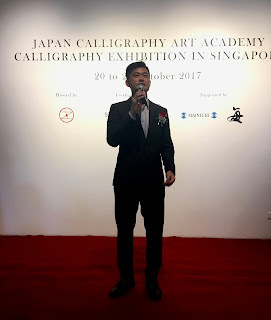 I mentioned to Teacher Joni how much pressure I'd feel if I were asked to perform in front of a large audience using such an unforgiving medium such as ink... I really tip my hat to the three wonderful artists who showed us different types of Japanese art styles that day. Look at the pretty floral embellishment on this art work. I also super loved the soft peach colour of the paper. A painting in a painting... Notice the soft blue mountains on the lower portion of this art work. It was done by Hasegawa Gyokuri and depicts a waka poem expressing the beauty of the ocean. Here's a poem by Li Bai about looking at a mountain. This one was drawn by Ohtani Yoshun, the second artist that performed that day. Again, I really love the energy in his work. 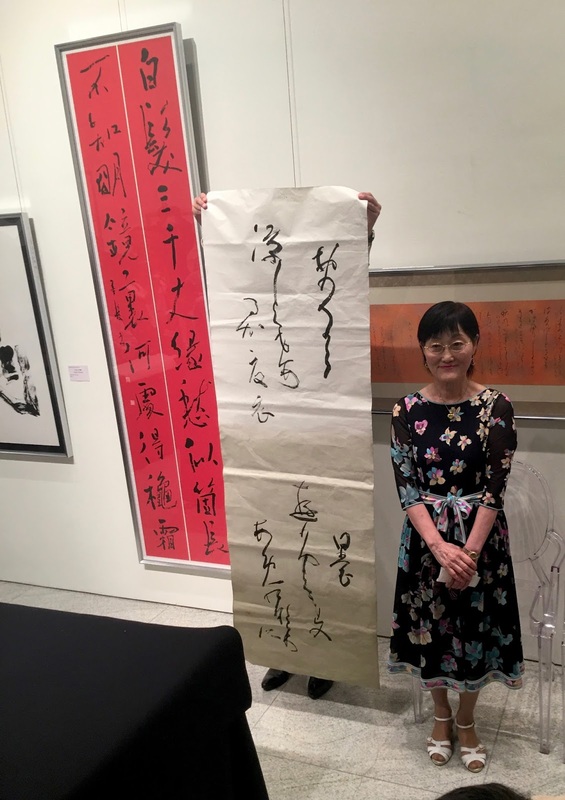 Lastly, here's another seal carving piece by Shimamura Misao that depicts some ancient Chinese phrases. I really loved the deep cobalt blue of the background. I've studied Chinese calligraphy before, and one of the stark differences between the Chinese calligraphy exhibitions that I've been to and this exhibition was the way the art works were framed. Chinese calligraphy is still displayed in its scroll form, hung from a nail on the wall. Whereas the paintings in this exhibition had really modern, minimalistic silver frames. I really liked that. I had a wonderful time viewing the art works. The Luxe Museum is just behind Plaza Singapura and is accessible by MRT (Dhoby Ghaut) and other buses. If you have the time this week, do drop by. The exhibition will run all the way till' the 25th of October 2017. 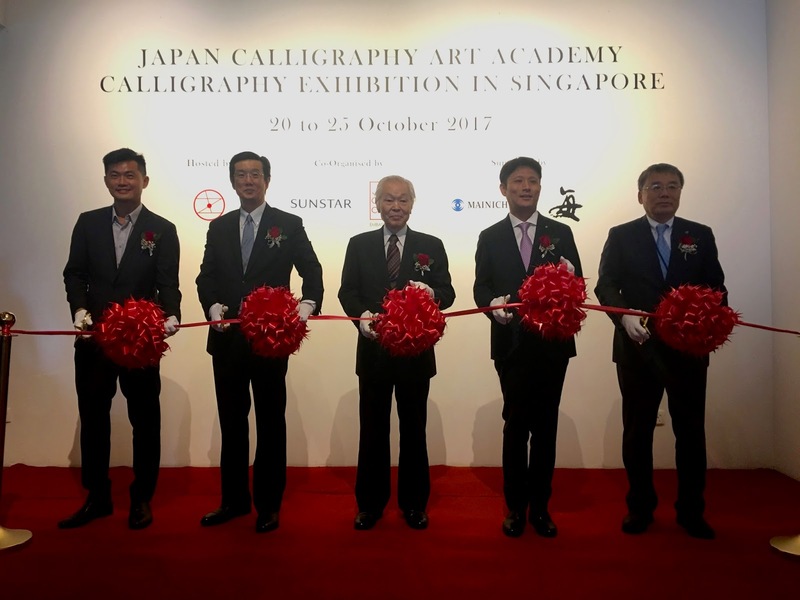 So calligraphy originated from japan I had no idea no wonder Japanese people always fancy their hand-writings but calligraphy is such an artistic expression using handwriting this is such an informative piece Stephanie.